These pages have many photos and may take a bit of time to load. 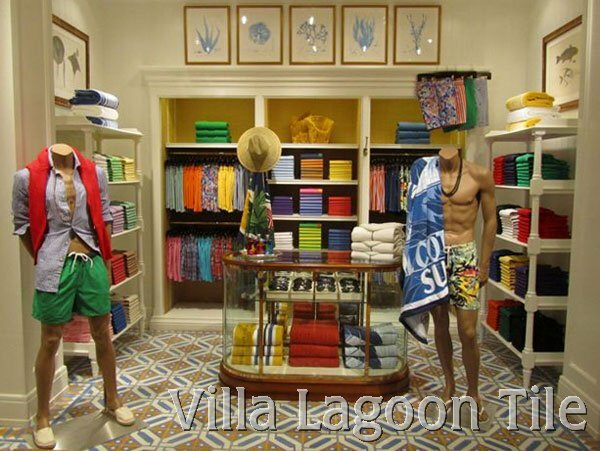 Above...Ralph Lauren store development team chose a custom color combination tile for their Barbados retail store. 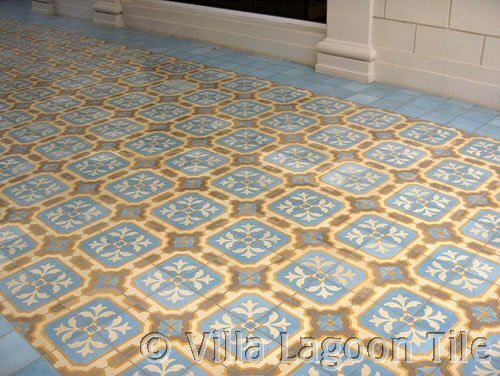 See more photos of the Ralph Lauren tile here. Below...Our Trapani "Midnight" with Ribbon Border "Taupe" in a master bedroom. 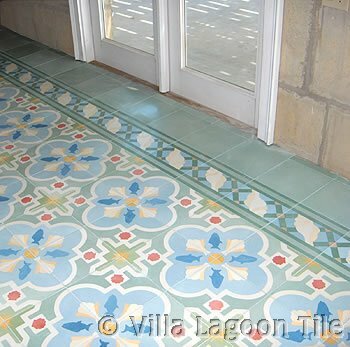 This is a waterfront home and the sea shells and marine touches in the tile add a whimsical touch to the otherwise formal and classic trellis pattern. Below-A kitchen floor of Surf "Agua" on the U.S. Gulf Coast. 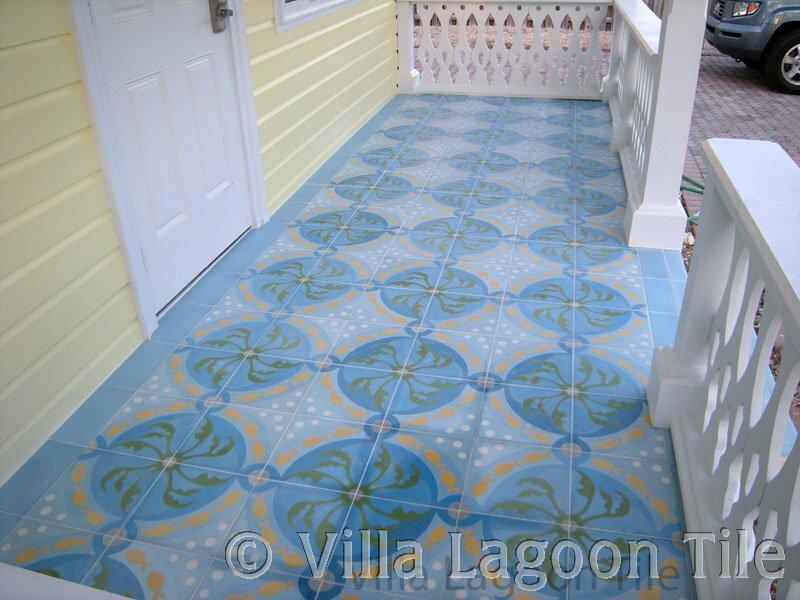 Below: An entrance foyer of Italian Trellis "Sunset" with Shell Scroll "Coral" and solid Goldenrod borders. 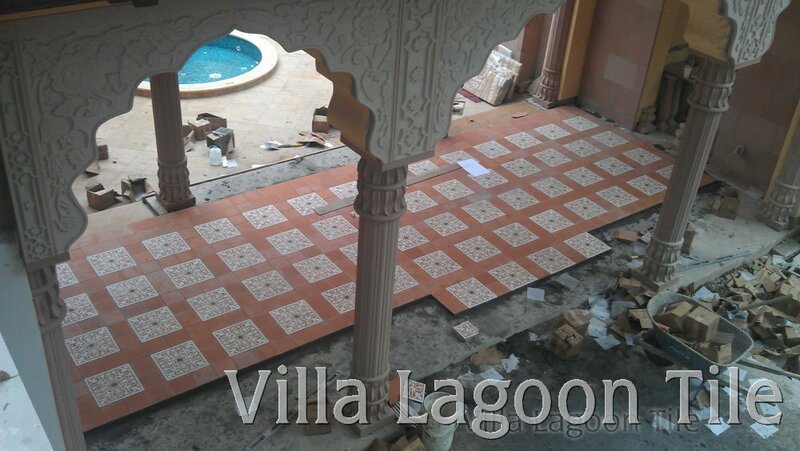 This is a creative use of our Pescado Coral tile with the less expensive solids. 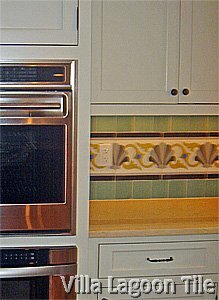 If using a pattern with a field tile and border always consider using a row or two of a solid to go to the walls. All your little cuts for doorways, and irregularities will go unnoticed and you will not have to make cuts to your border. This narrow hallway now seems much larger and certainly more grand. 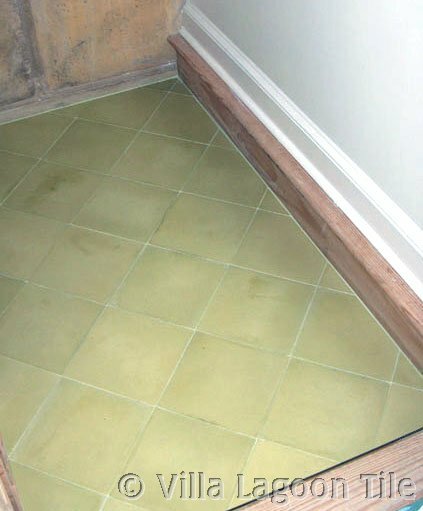 Below: A stair landing of solid tile laid on the diagonal. 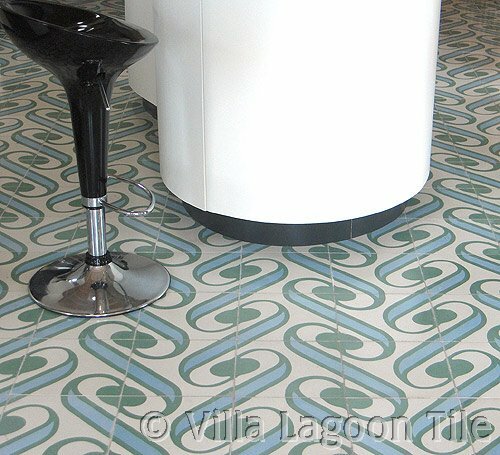 "Catalina" cement tile with solids. 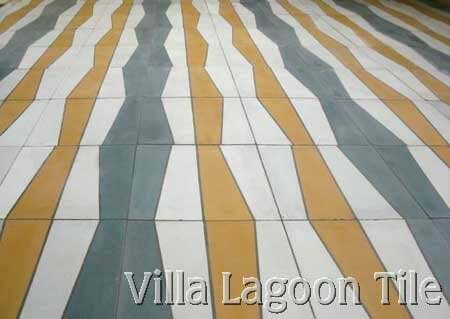 Notice the variations in color from tile to tile but the over all effect is rich. 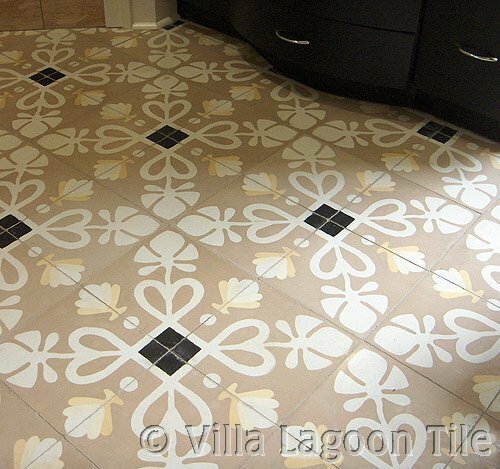 Below: Savona "Beach" guestroom floor in a coastal home. 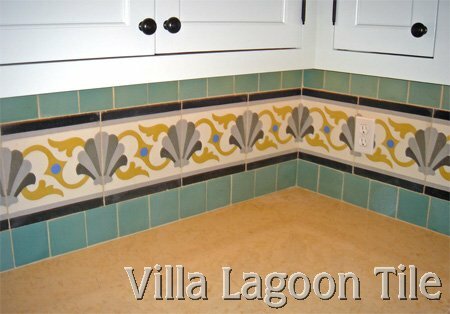 This tile can be made both with and without the fish motif. 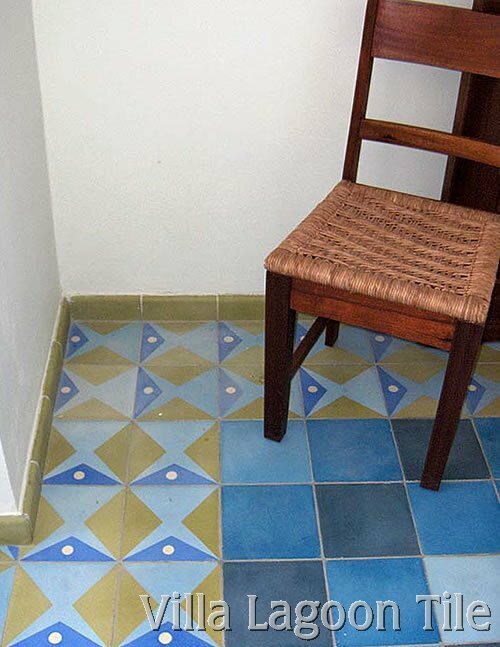 Above: This is the entrance to a ground floor apartment paved with hexagonal cement tiles in solid colors from our palette. 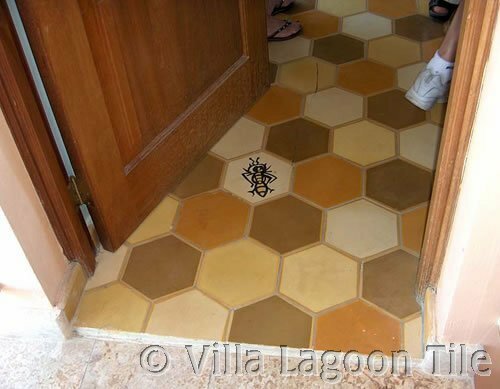 The abstract bee (called Riley) is a special order tile designed by a Caribbean artist Thimo Pimentel. 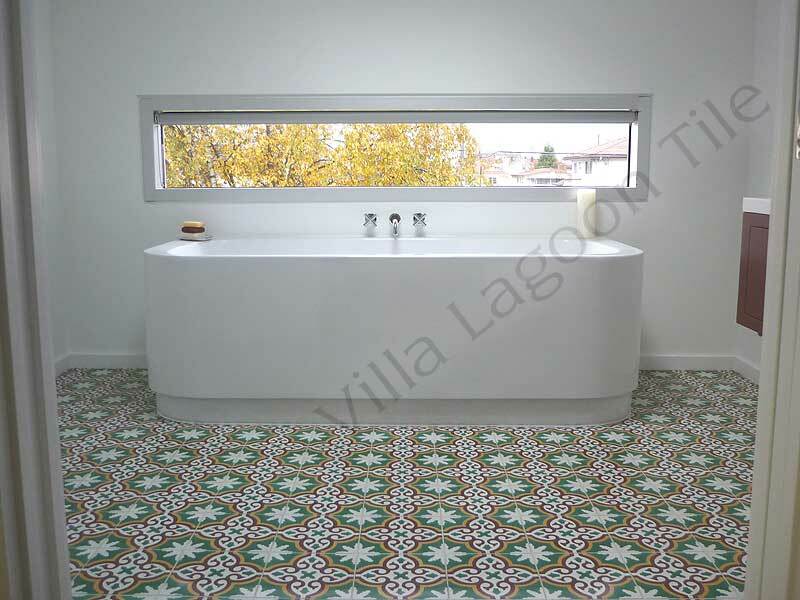 Do you see fish or just a contemporary geometric cement tile pattern ? 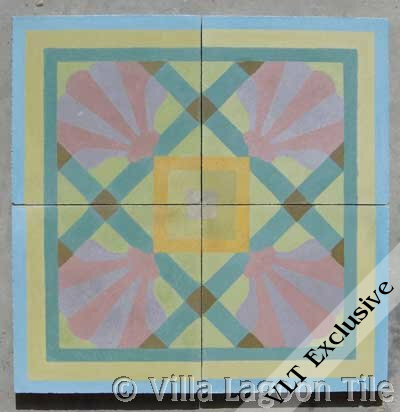 This custom tile design, called Juanillo, is by artist Thimo Pimentel. We can create a mold to your own designs. Note the blending of numerous colors of blue in the cental part of the room. We can help you create a custom blend of solids. 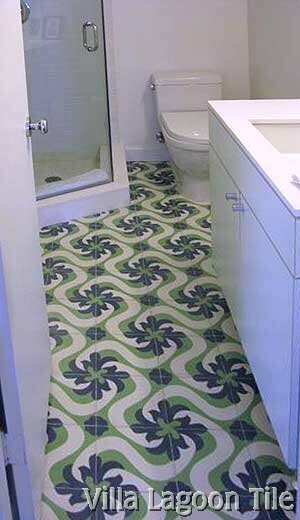 Below: a cement tile bathroom floor. This is Foliage corner tile from the Foliage Border used as a field tile. 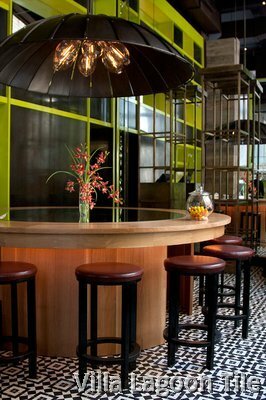 Above: Tony Chi | Interior Design ...Brio Restaurant NYC using our Marrakesh tile in Black and White...More pictures. 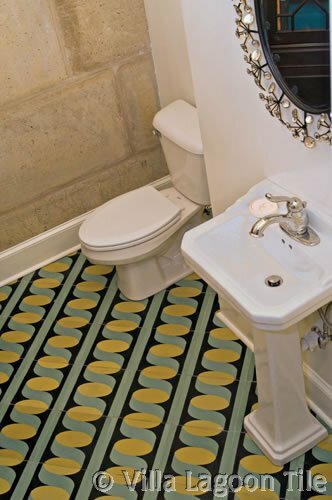 Below is a half bath with a cement tile floor of Ribbon Border tiles laid as a diagonal stripe design. 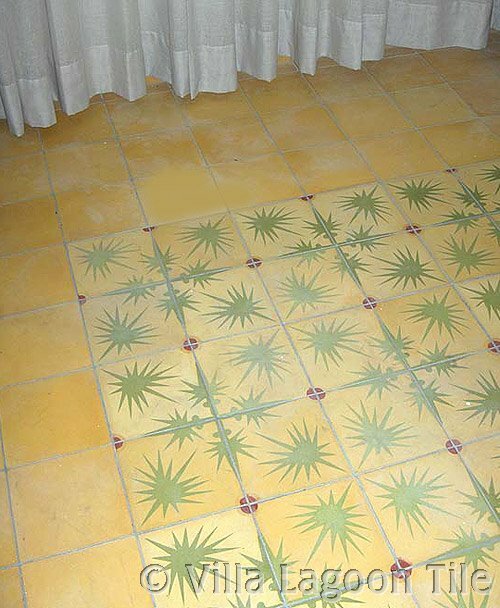 Below is a bedroom floor of Mayles Cana, a custom artist designed cement tile at the home of artist Alonso Mateo. 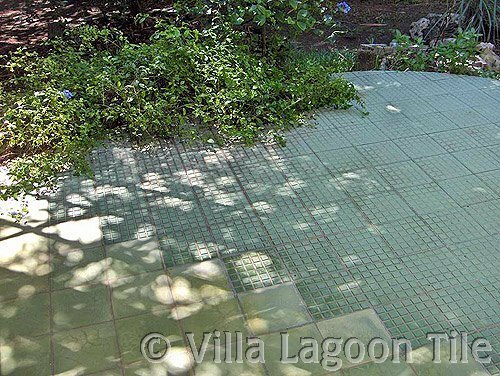 Below-Outdoors, paving can be made more interesting and provide traction by combining our solid cement tile with our custom relief cement tiles. An in-progress photo of a home in Dallas. Click to see this photo larger. 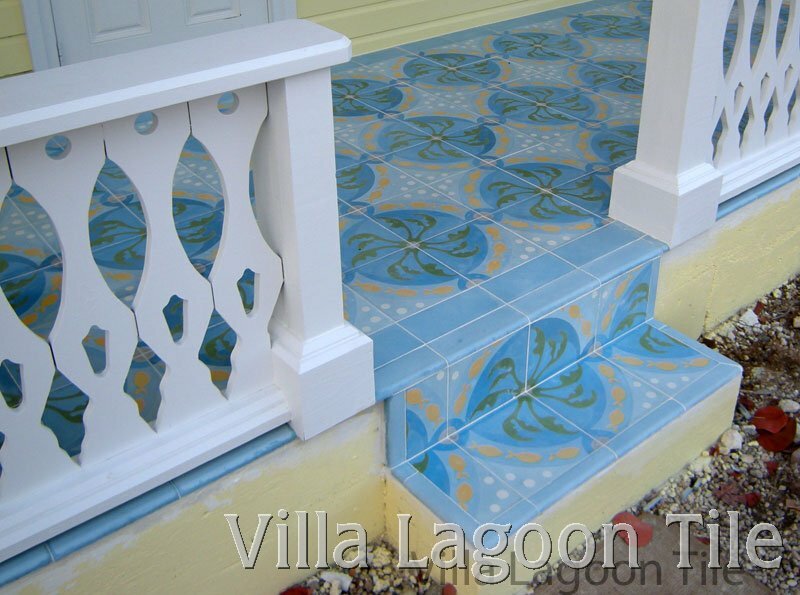 Below is a Cement Tile porch of our Pescado "Azul" tile located in the Florida Keys. 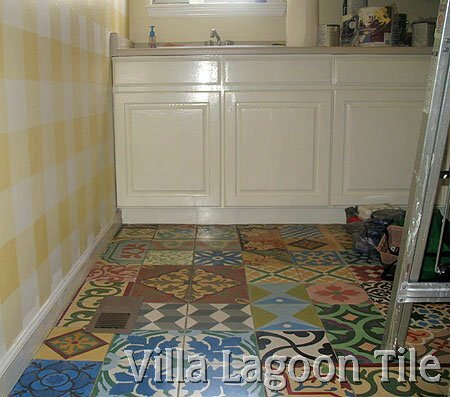 Hi, Lundy and Dave, my friend who is a very talented contractor/jack of all trades came down end of last week and we got the tiles installed. I could not be any happier. They are really beautiful and extremely unique as you know. 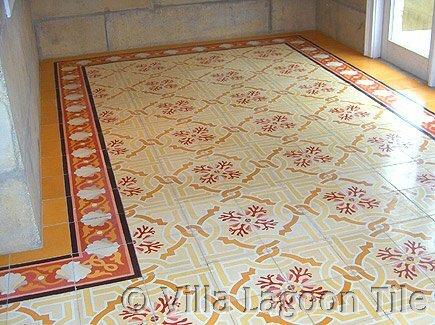 Nobody has ever seen tiles like this except for older Cuban neighbors and passersby's who remember them from home. We have had a steady stream of compliments. 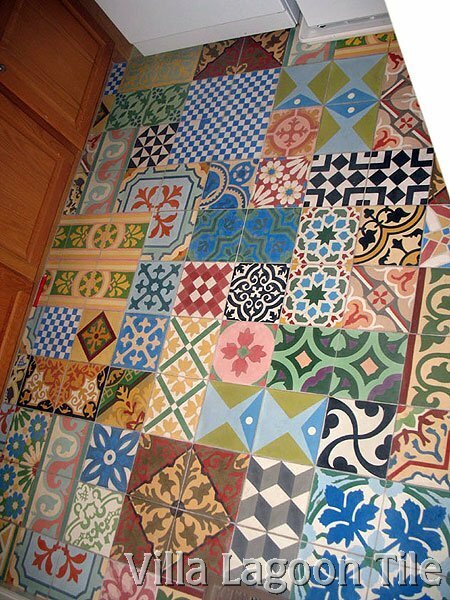 Anybody wants to know where I got the tiles I will send them to you ! ! 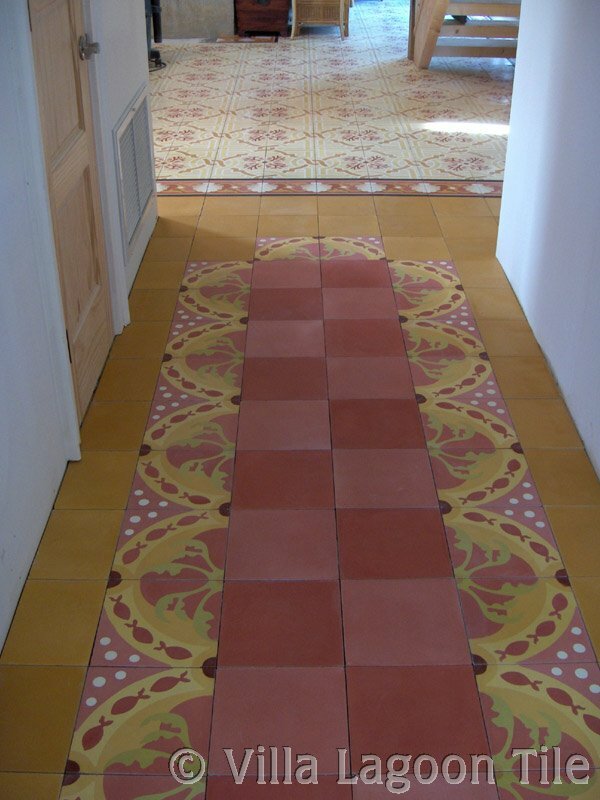 Below: A long hallway in a Gulf Coast home that uses Trellis Shell in custom colors along with solids. Creating interesting designs in a long hallway is one of the best ways to turn an otherwise boring space into a visual treat. 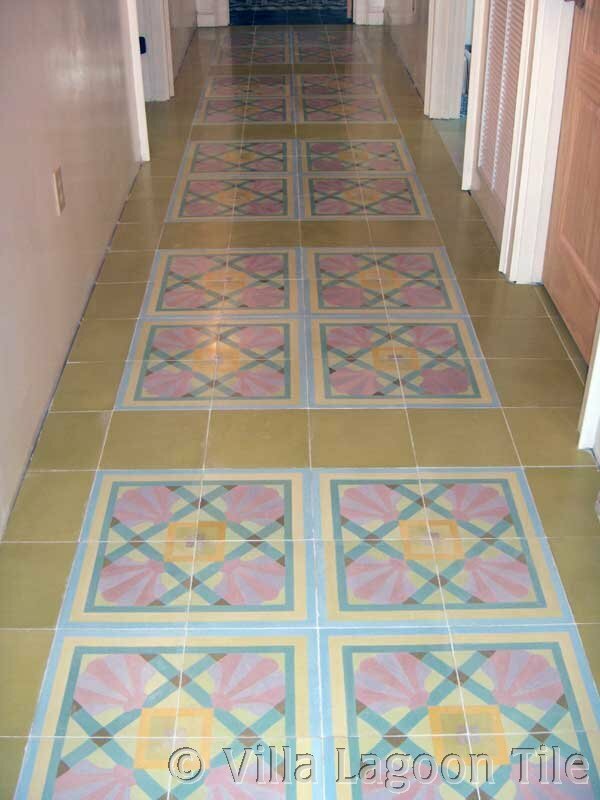 Contact us for hallway designs and line drawings so you can create your own custom color tiles. 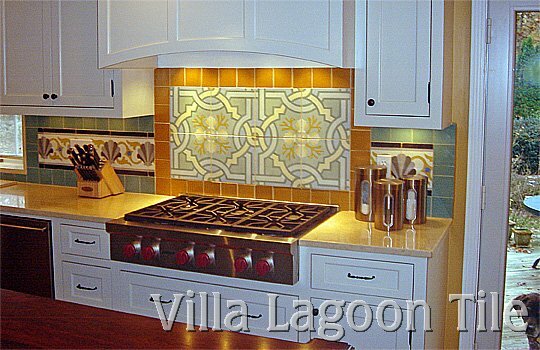 Request a Trellis Shell line drawing to create your own custom tile. 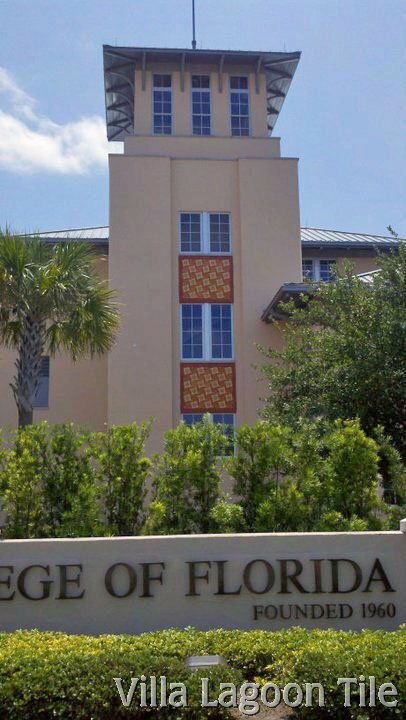 New College of Florida--Custom Designed Tile based on their logo. 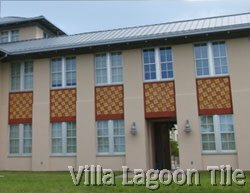 Our 10" cement tile on the exterior of a college administration building in Florida...read all about it and see close-ups. This contemporary tiled bathroom is in Vancouver, CA. 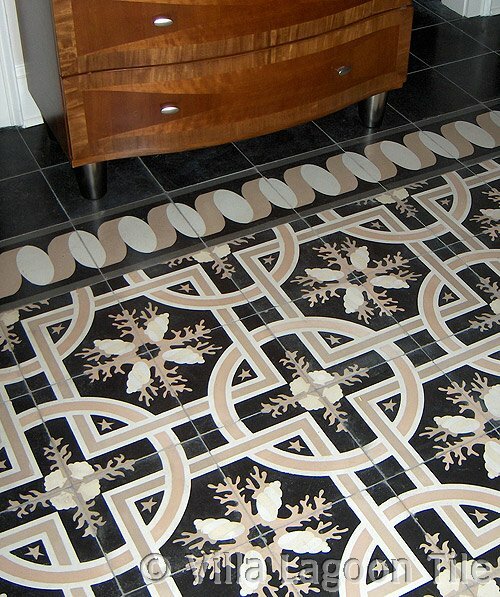 with custom Bocassio (aka Neiba) pattern tile. 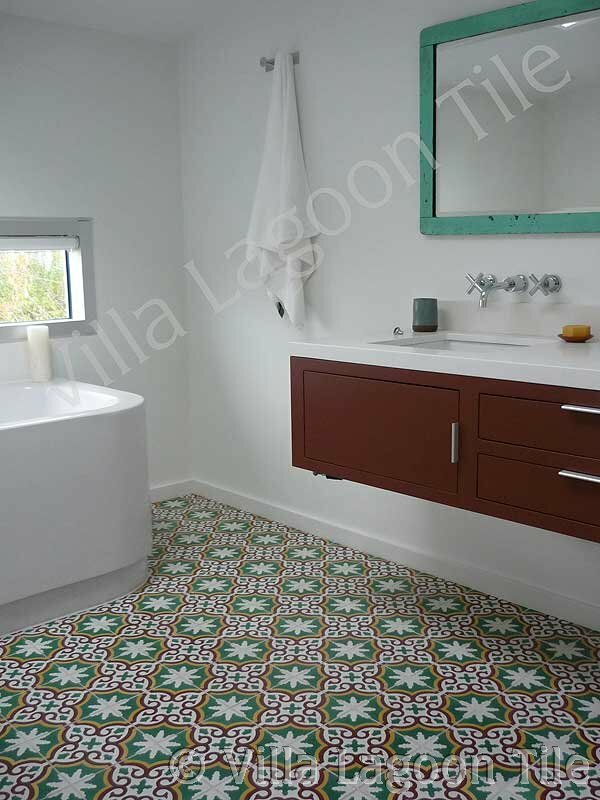 One of our repeat clients, a talented film producer, sent us photos of her small bathroom done in CH-150-2B tile. 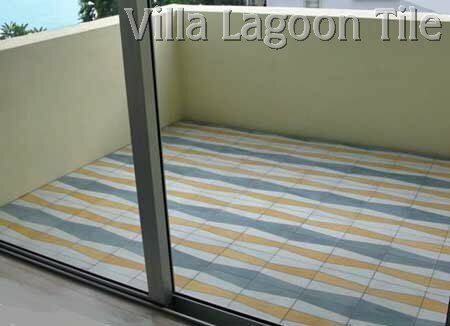 Notice how the jazzy bathroom floor takes emphasis off the small size of the oceanview condo. 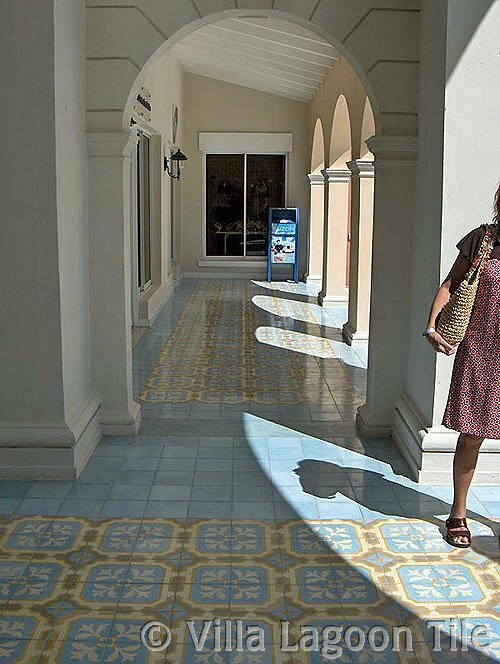 This same condo has one of our tiles, the 10" Bisoux, on the balcony. Again, this clever condo dweller has brought lively interest to small spaces.